Mauritania and Guinea, West Africa. 36 were mineralised and assayed. A238 and at depth below the existing A238 resource. 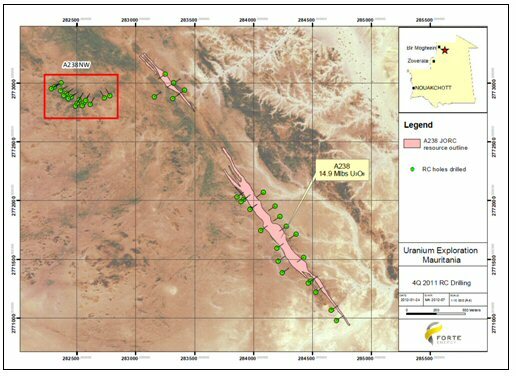 followed by drilling of the calcrete hosted uranium prospects at the Hasi Baida (948) licence. *   A238 resource update is expected be announced in Q1 2012.
identifying over 31 radiometric surface anomalies. on the 7th January. By the 20th January drilling was progressing well with 20 holes (1,800m) completed. U3O8 was announced in June 2011 at 100ppm U3O8 cut off grade. and west of the original inferred resource outline. in a new window: http://media3.marketwire.com/docs/fte0201fig1.jpg. of A238 testing the extensions along strike and at depth. (See Figure 2). update by the end of Q1 2012.
surface, typical of a calcrete type deposit. U3O8 for 11.6Mlbs contained U3O8 at a 100ppm U3O8 cut off. both the size and confidence level of the current Inferred JORC compliant U3O8 resource. infilling in areas where access was not possible previously and testing the down dip extensions. Assay results are expected in April and May and a resource update is scheduled by the end of June. 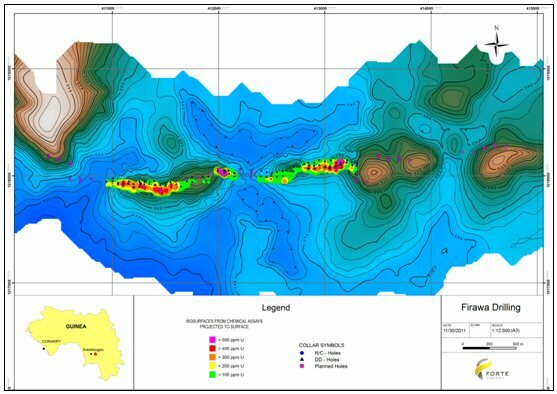 completed by SGS Ltd (West and Central Africa region) and is currently under review. lbs of U3O8, as well as gain a significantly better understanding of our known uranium deposits. 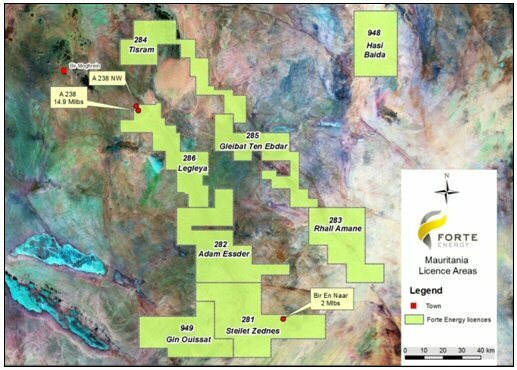 Mauritania in Q1 and Guinea in late Q2 of 2012.
correlation of REEs with uranium mineralisation. ?Australasian Code for Reporting of Exploration Results, Mineral Resources and Ore Reserves?. Mr.
form and context in which it appears. (hons) FGS, MAUSIMM, Principal Geologist of CSA Global Inc (UK). Code for Reporting of Exploration Results, Mineral Resources and Ore Reserves". Mr. Gustafsson, Mr.
their information in the form and context in which it appears. Introduced 1/7/96. Origin: Appendix 8. Amended  1/7/97, 1/7/98, 30/9/2001, 01/06/10. 2   This statement does give a true and fair view of the matters disclosed. Sign here: ......................................... Date: 31 January 2012.
percentage interest and conditions precedent in the list required for items 6.1 and 6.2. 7.1 and 7.3 for fully paid securities. AASB 1026: Statement of Cash Flows apply to this report. Australian standard on that topic (if any) must be complied with.